Do you ever go to Twitter and think, "This is neat, but I wish it was more focused on me"? The company released a new app on Tuesday called Engage that flips the experience upside down so you only see things that happen to your account. There is no pesky timeline to distract you with the thoughts of people who aren't you. The free app is available for anyone on iOS in the U.S., but was built specifically for people or brands that have cultivated a large following on the service. Think "creators, influencers or public figures" -- and anyone who goes by Rihanna, Taylor Swift or POTUS. The app is divided into three sections, Engage, Understand and Posts. You can see all your mentions or just reactions from more elite verified users. 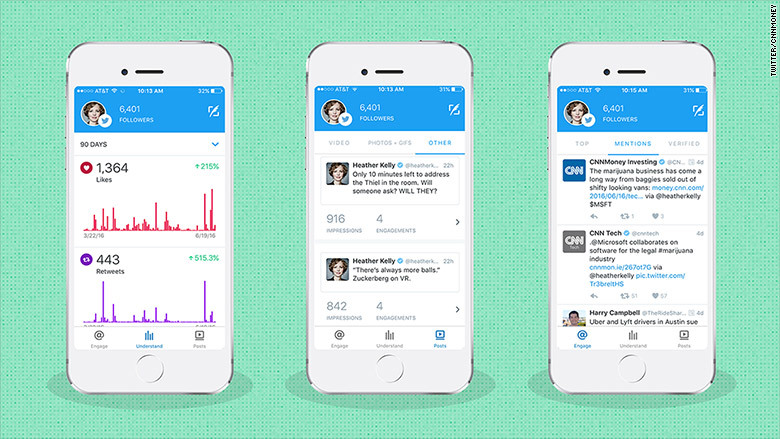 Colorful graphs show all your likes, retweets, mentions and impressions in real time. You can look through a list of your posts to see how many impressions they garnered, or just relive your own witty comments. A pleasant side effect is that the app provides a safer, more protected way to experience Twitter. Unfortunately it's not much good for regular users who are more interested in conversations than tracking their own budding fame. Twitter (TWTR) has taken a lot of flack for failing to address abuse and bullying on the service. It's rolled out some tools just for verified users and made minor tweaks to reporting tools, but for many people it hasn't made a dent in the streams of harassment. Engage is similar to Facebook's (FB) Mentions app, but that tool is only available to verified public figures.